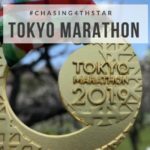 I ran the Tokyo Marathon a few weeks ago to earn my 4th star in the quest to finish the 6 World Marathon Majors (Berlin and Boston left). It was an absolutely amazing end to my 2 weeks in Japan, even though we ran in cold rain! 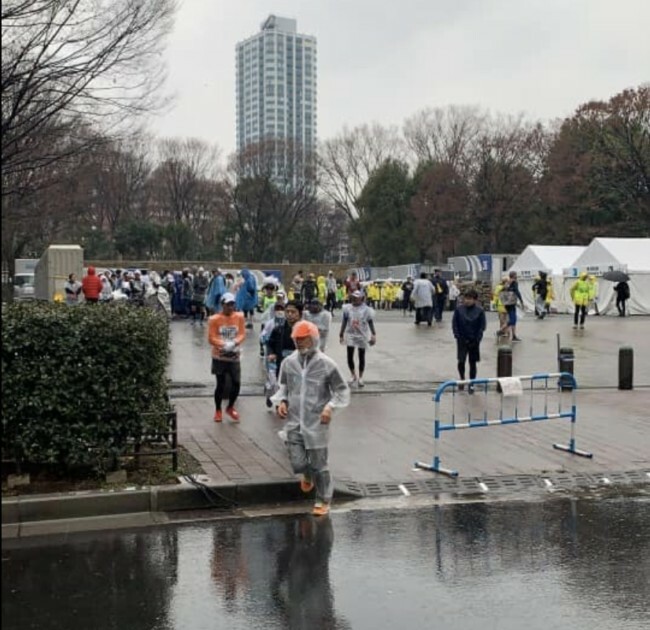 Even though it is one of the World Marathon Majors, and at marathon #9, I am not a complete novice; Tokyo marathon is a bit different from other marathons I’ve done. 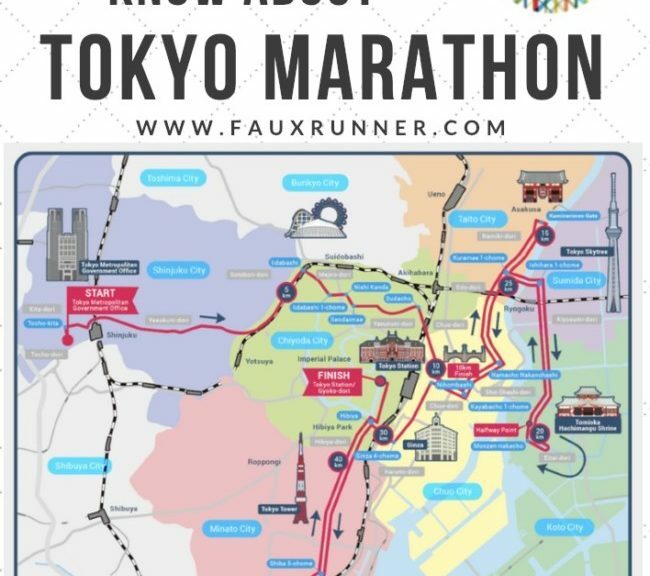 Leading into the race, I had researched hard on many aspects of the Tokyo Marathon that you normally would not know about and since they all played such a vital part in my finish, I wanted to share some of the things that I learnt. (I will write up in more detail later, but still including a few quick tips here). 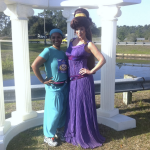 If you want any kind of race merchandize – go to the expo on the first day and buy it as soon as you see it. I went on the first day (in pouring rain) and saw a ton of merchandize, but the runners on the later days posted their disappointment. (Psst… don’t be too disappointed. You can try your luck at the ASICS stores in the city. These stores have race merchandize even before the expo opens, especially their flagship store in Harajuku. Also, don’t forget to check out cool offerings from Nike, even though they are not the title sponsors). The coveted marathon jacket that was available in all 4 colors in all sizes on Thursday late evening but already sold out in popular sizes by Friday evening. The jacket is more like a windbreaker and since I never wear windbreaks (plus I have jackets from London Marathon and Marine Corps Marathon), I opted not to buy them. Also to note, budget for race photos. They are about $200 for the entire set or $40/photo. The start gates open at 7am, corrals open at 8am and the race starts at 9:20am. The runners handbook states that the corrals close at 8:45am and if you don’t make it to your designated corral by that time, you will be asked to start at the very end after all the corrals. While I have not heard of anyone who was denied entry into their corral, given the Japanese efficiency, stickler for rules and sense of time, I think it is a high possibility! Don’t tempt fate. There are no portapotties in the corrals (runners report some being just outside of corral B, for every other corral the portapotties were in the general area before you entered the corrals – a couple of minutes walk away). The portapotty lines in the gates are super long and atleast one other runner has mentioned about having to ditch the line at 8:42am to run into their corral by 8:45am. With 30,000+ runners, it is obvious that the start area would be crowded. New York and London has the luxury of huge open spaces to stage the start (Fort Wadsworth, Staten Island and Blackheath & Greenwich park, Greenwich respectively). In contrast, Tokyo stages its start area in Shinjuku, in the heart of the city amidst skyscrapers and hotels and roads. 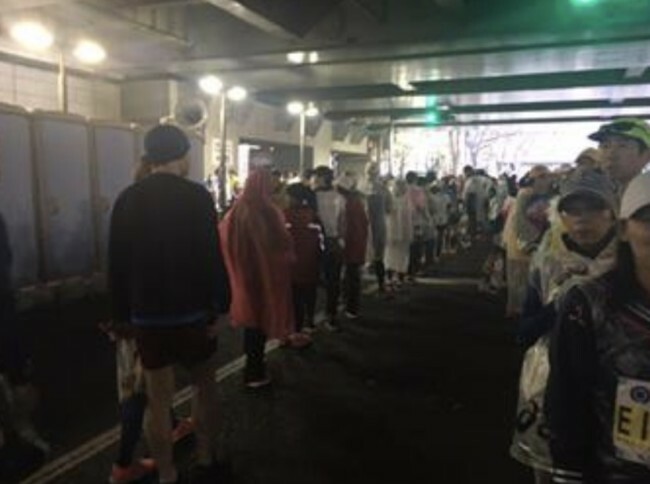 While all 5 gates for runners were clearly marked with plenty of volunteers including those who spoke English, once we got out of Shinjuku station, it was a sea of runners and chaos (to me). I had met a nice guy on the train who was British, same gate as me (gate number 3), and same corral as me (pink bib K). We intended to find our way out together and start together, if possible. And we did, until we got to the entrance of the gates. By the time our wrist bands were scanned and bags checked, we lost each other! There were people EVERYWHERE, hanging out under the overpasses, away from the rain. The race is run according to gun time – the start of 9:20am no matter what time you cross the start line. You will personally get a net time from your chip as well, but to all purposes the race starts at the gun time of 9:20am. How does that affect an average runner? If you are lined up to follow an official pacer, the pacers run to gun time. 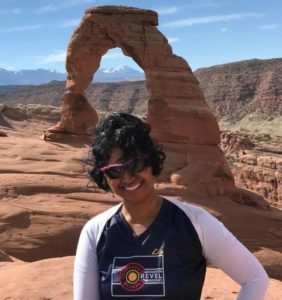 My corral K had pacers of 5hrs 30min finish, until I read on their bib ‘I run by gun time’; which meant that they were running a 5hr 05-10min finish. If you are a slow runner (6hr+ marathoner) and you are in one of the last corrals, you have already lost some time to the clock by the time you cross the start. Time very vital to beat the checkpoints. 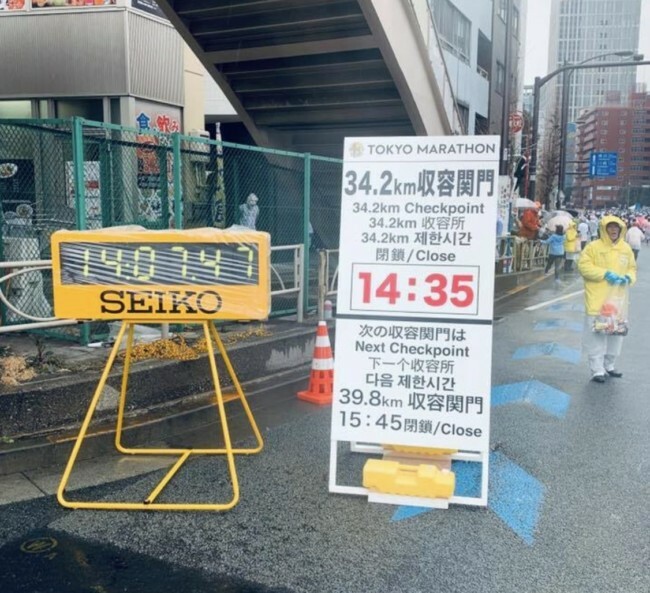 A lot of marathons have time cutoffs and checkpoints (a famous one is Marine Corps Marathon’s “Beat the Bridge” and Big Sur Marathon’s 6hour finish time), but Tokyo marathon’s mid-race checkpoints are notorious as they don’t make much mathematical sense. STRICT time cutoffs. If you are in the later corrals, and you are a 6:00+ hour finisher, be aware that your pace earlier in the race would be faster to meet checkpoints, atleast until 30km. For me, a usual 6hr marathon (Although I’ve been trying to break past 5:45 forever!!!) and starting in the last but one corral “K”, everything came down to what time I crossed the start line. If you took more than 20-22min to start, then you need to run the first 10km as the fastest segment of the race. And still the first 30km faster than marathon pace. Not the best of marathon pacing strategy, but exactly what is needed to make it through all the checkpoint time. 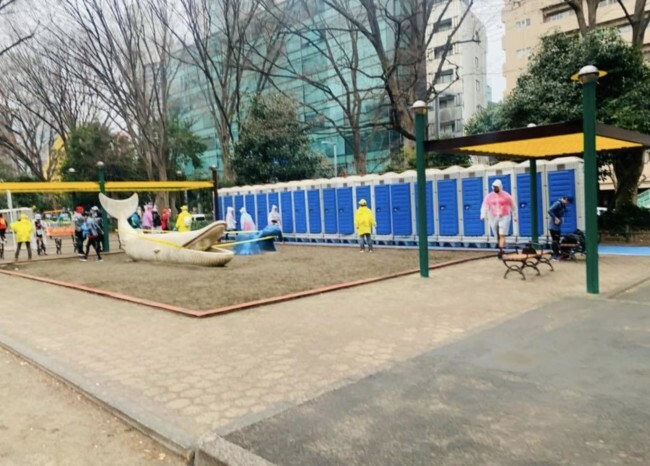 Compared to some of the other marathons I’ve done in the US (and London Marathon, my only other international marathon), there are very limited portapotties. The lines were long, long, loooooooooooong … so very long. Long lines at the start before entering corrals and long lines on the race course, especially in the beginning! Between corral E and F. Runner waited 35 mins & just made the 0845 gate time. Only Corral L (the last corral) reported have portapotties right inside the corral and those with zero lines. There are also portapotties on the course that are not actually on the course – there were people holding signs indicating the detour. Many runners have said that they were able to find no-lines/very-little lines more than half way past the start; I didn’t find any. Plenty of 7-11s on the course seemed to be ok with runners popping in. In fact, the runners handbook advised against using toilets in hotels and shops at the start, but mentioned 7-11s on course. No glass bottles, aluminium cans, metal Thermo bottles, or plastic PET bottles. Bottom line – no water bottles. They are very strict and will confiscate your bottles politely but firmly. Unopened items like Gu, Clif Shot Bloks are allowed as long as each individual item is 250ml or less for a combined total of 500ml or less. The jury on brining an empty hydration pack or handheld and fill it up after the security is still out. When asked at the expo, we were told no by some and yes by others. 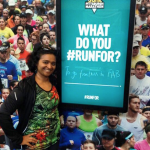 Runners who contacted the Tokyo Marathon foundation via email also had various answers. 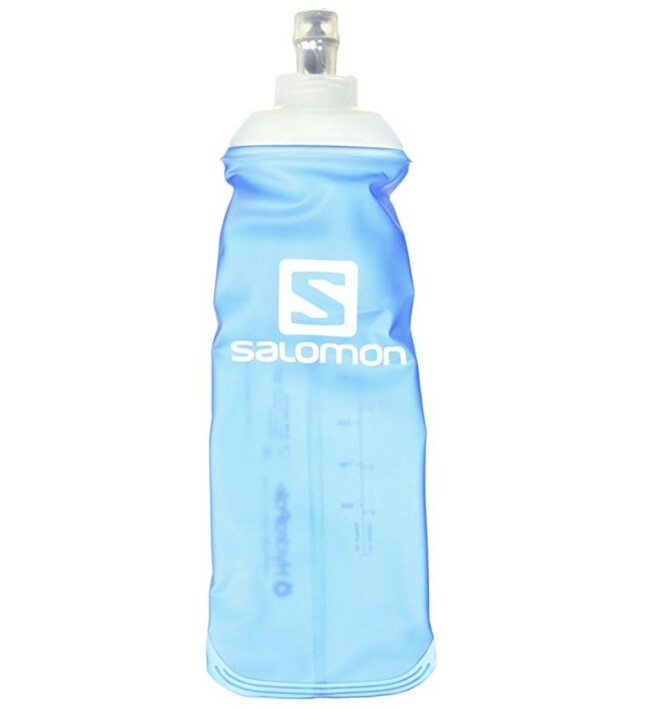 I saw some runners being asked to put away their soft pack hydration reservoirs at the security gates, but I saw quite a few runners with them on the course. I risked to take in an empty 250ml Solomon soft flask and I was waved in. How/why does this affect you? If you use a liquid nutrition like UCan or Tailwind that you consume 30-45min before the race and during the race, you will not have anything to mix it in. Some runners have mentioned being able to mix tailwind in small amounts in the open water cups, but you could not do that with UCan. Also, if you are someone used to sipping water at regular intervals along the run, you might have to practice running with limited water (the first water stop is at 5km and then every 3km). I both use Tailwind and sip a lot of water and was training to run without needing to drink for the first 5km. I wasn’t successful during my training and I was really glad to have the flask with me. 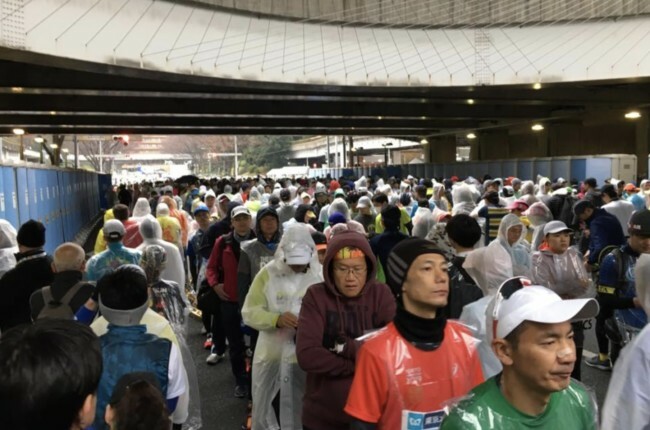 Japan is a very clean country and the marathon was no exception. Volunteers were holding trash bags for you to drop in gel packets, etc. Running through water stations in large races is a slipping hazard for the back of the pack runners due to discarded paper cups and later orange peels, etc. At Tokyo, by the time I went through, it still looked like I was the first corral! Pocari sweat is the official supplier of electrolytes on course (and before/after). It tastes milder than gatorade and I haven’t heard of anyone not liking it or having GI distress from it. During training, you can order it from Amazon, or buy it at your local H-mart. After the race, all runners were to collect the medal, space blanket and their checked back in according to the color assigned. My pink bib(charity runners) had a long walk before I could get any. 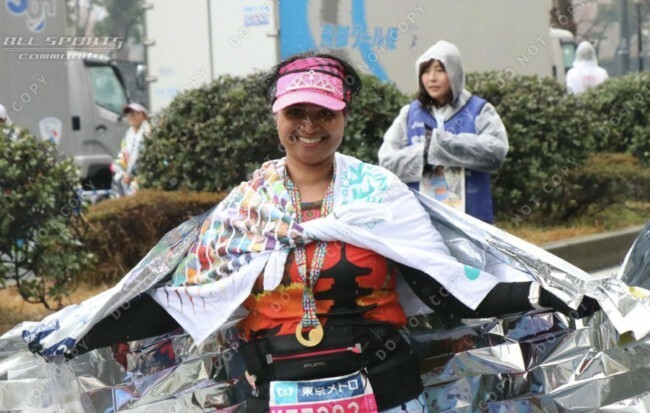 By the time I got my medal, a finisher’s towel and space blanket, I had walked for what felt like eternity in the cold rain. In 2018, charity runners were bussed to their final destination; I do not know if this was after the medal & space blanket or before. By the time I got my towel, medal and space blanket, I really did not care for anything and just wanted to get warm. Lottery runners were given the option to choose from a post-race warming poncho or a bag check (the poncho from New York City Marathon is very warm and an awesome souvenir). 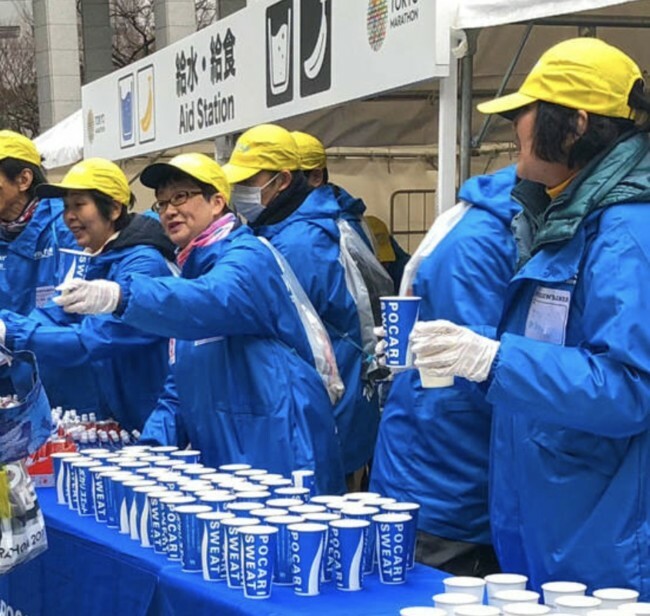 However, in the Tokyo Marathon, Charity runners were not given an option and we HAD to bag check. Every charity had their own lounge and family meeting space. But due to the rain and already shivering from the cold, I opted not to go to the charity lounge. 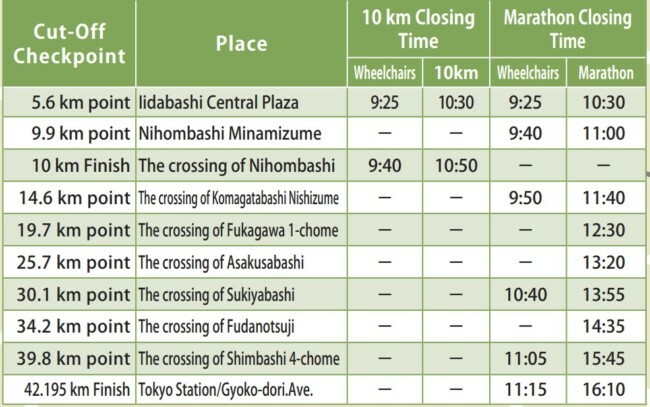 Since Tokyo is a point-to-point course, you will either have to take a ride to the start or the finish or both. 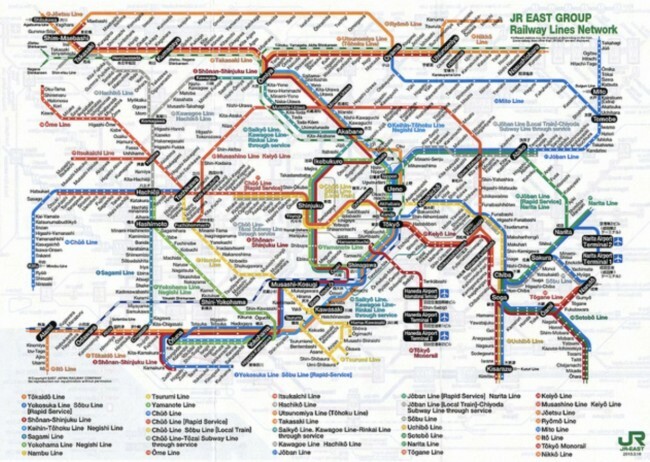 The station to get to the start is Shinjuku and is massive with various systems of train lines and exit points – like an underground city in itself. On paper and google maps, it looked like I had to take Metro Marunouchi line from Otemachi station (near the finish line) and Shinjuku station for the start. I did a dry run a couple of days before the race and wasn’t entirely comfortably but I reckoned that I’d just “follow everyone else” on race day. That “follow everyone else” made me walk between 1-1.5 miles to my start gate because guess what – Murphy’s law dictated that my gate was the most roundabout from the exit I took at Shinjuku station. 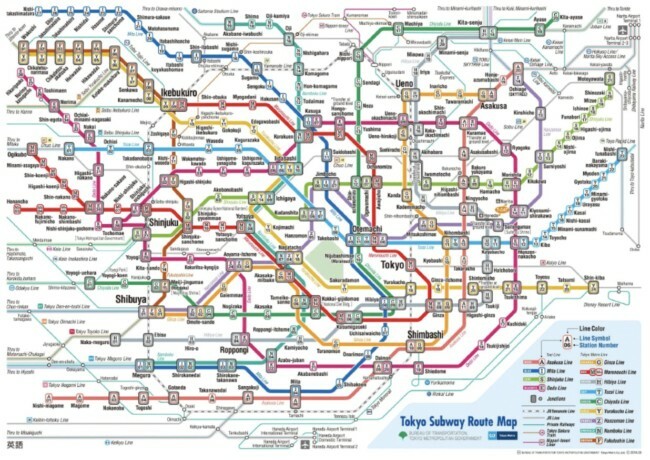 Tokyo also has different train lines (the Tokyo Metro, JR lines, and Toei Subway amongst others!) all passing through the same stations. Every Tokyo marathon runner is given a Tokyo Metro card as part of bib pickup. 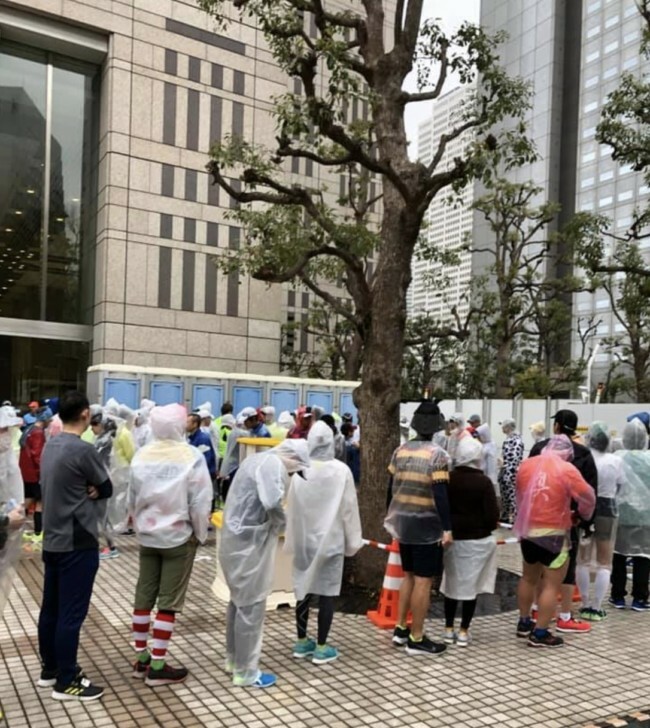 The Metro Marunouchi line was perfect for me to get to the start of the race, but I had to walk more (or it seemed like I walked 5 miles) to get back to the Metro line from the finish even though the Toei line was right there. (I had initially planned to walk the 5-10minutes to my hotel but I was shivering and hurting badly and decided to take the train. Bad idea since the getting to the right metro line took me away from the direction of my hotel). 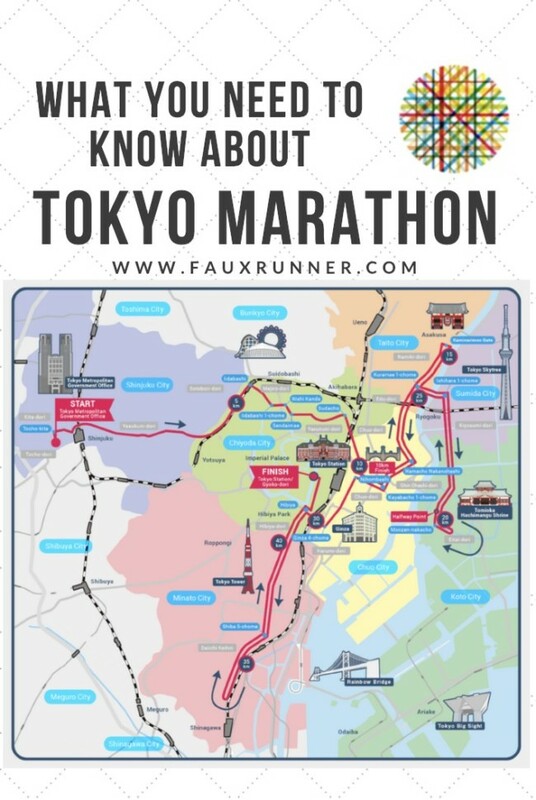 I was able to get a lot of information from reading the Tokyo Marathon site, but the contents are not very English friendly. 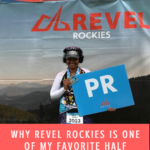 Of more value was old race reports and Facebook groups (seriously, if you plan to run Tokyo, join the Facebook groups. You can remove your FB profile after your race, but both groups are a wealth of knowledge. Without them, I would not have been half as prepared with race logistics as I was. Enjoy the race, eat all the food (or as much as you can if you are a vegetarian like me!) and spend a few extra days in Tokyo and tour the rest of Japan if you can. Tokyo Marathon is a worthy World Marathon Major race (although some may dispute it because of the checkpoints), a good race in a great city made even more awesome by the race volunteers. This post was SUPER informative! 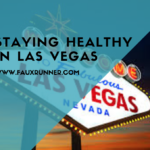 I’m not sure if I’ll ever get to run this marathon but thank you for all of these tips. I’ve heard similar things about the merchandise and the long walk after the finish line. It’s a blessing in disguise I didn’t make the lottery this year (my first attempt). Making the cutoffs would have been a push, and I highly doubt I could have done it given the weather conditions. I paid very close attention to all of the FB group posts and will continue to do so leading up to the day I eventually get to run it. I can’t imagine making my way all the way there and being swept. I will keep trying the lottery and will bookmark these excellent tips. Also, even more convinced to spend time acclimating in Japan first before the race! Great advice! I’d love to go to Tokyo. Do you need a qualifying time to enter? Now I know why the Honolulu Marathon (which was my first and I’ve done many times) has so many runners from Japan. It is so much logistically easier and they don’t have cut off times. I’m glad you enjoyed your race, and I’d love to visit Tokyo, but the logistics of this race sound so complicated! Thanks for all of this information but personally to me it is all too complicated. 🙂 I am sure I would miss something and mess up. I have never heard of Pocari sweat, will have to check it out. This sounds logistically like a tricky marathon. I am glad you were able to carry your soft bottle so you could stay hydrated as needed. Great tips! Wow, so amazing that you did this race! I love all of the tips here, I can imagine the logistics were a lot to figure out and I appreciate you sharing what you learned there!! Congrats,again, on your successful marathon in Tokyo!!! It sounds like such a fabulous event! Congrats on the race! Looks like it was a pretty wet one from what I saw. I like (and dislike) their time cutoffs. It’s a cool concept and totally appropriate for the Japanese way of life. Yahoo on finishing the Tokyo marathon! 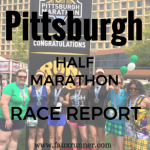 This is a lot of great info about the race! I am sure it will come in handy for future runners! Love that they keep the race course so clean! I wish they were better about that here in the states!